On our trip to Tampa, Florida, we planned to do several things in the city and spend a day at Busch Gardens. When planning the vacation, we considered a hotel near the theme park because of price. We chose the Courtyard Marriott Downtown instead, after considering three important factors. We’ve all seen the commercials (with that little gnome guy), where the family arrives at their vacation hotel only to discover that the great bargain they expected isn’t what they got. Sometimes the “best value” isn’t really the best value! To make sure you’re not one of those people, use these three tips to select a hotel to find the perfect place to stay on your next vacation! Hotel features and amenities. How do you plan to use the hotel during your stay? Will you spend time there relaxing? Will use the exercise room or the pool? Will it improve your vacation experience if breakfast is included? How large is the room (will the whole family fit)? Check with the hotel about renovations or seasonal pool closures that might affect your trip. Price. 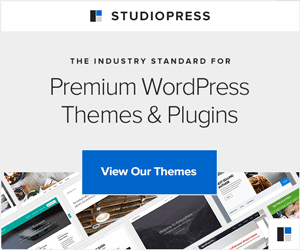 What’s your lodging budget? Look at hotel brands that fit your price range. Select the hotel that offers the most features for the amount you have to spend. Compare prices online, but be sure you compare rooms that meet your needs. Some online discounters only provide rooms for two adults — and your family of five just won’t fit in a room with a kingsize bed! Location, location, location. What do you plan to do on vacation? Select a hotel in a location that makes your vacation better. If you’re headed to the beach, it can be challenging to find day-visit parking. Consider a hotel within walking distance of the beach so you don’t have to mess with loading and unloading the car, finding a spot for the day, and all the day visitor traffic. 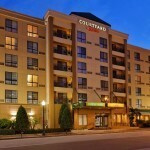 We ultimately chose the Courtyard Marriott Downtown because it is conveniently located near the city center. Since we planned to do many things in the city during our trip, staying there offered convenience compared to hotels outside the city. Beyond its central location, this hotel also offers great amenities, including a pool, exercise facility, grilling area, bar/lounge and sports court. The hotel provided the basketball, and my teen sons enjoyed some one-on-one hoops when we had down time. 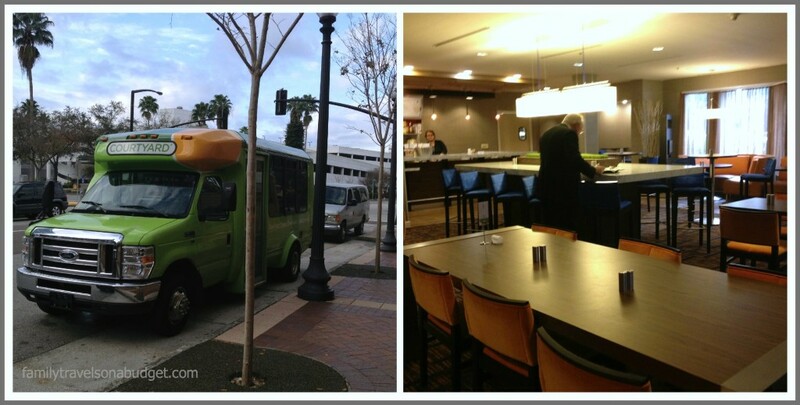 Another great feature at this hotel (and most hotels in downtown Tampa) is the free shuttle. We used the hotel shuttle several times and left the car parked, saving on gas and the need to navigate. Parking at this hotel costs $12/day, but it provides secure off-street parking and valet services, definitely worth the investment (Be sure to tip the valet a couple dollars when he brings your car around for you). Downtown Tampa offers so many great activities for families, and this hotel is located in the heart of it all — near the art museums, Riverwalk, Sunday open air market and many unique restaurants and clubs. I can honestly say we are glad we chose the downtown location for this trip! One factor that made our experience even better — and deserves a shout out here — is the staff at this hotel. The front desk staff was attentive throughout our trip, welcoming us back to the hotel after our day’s adventures. It wasn’t just us, either. They were kind to everyone. During a particularly hectic checkout period, the general manager pitched in just like one of the guys at the valet desk. The housekeeping staff got to know our daughter’s name and greeted her whenever we passed by. Their kindness enhanced our stay! Even numbered rooms face the Residence Inn and lack a city view (they do overlook the pool and sports court so you can keep an eye on teenagers). The pullout sofa in King Rooms is a twin bed, not a double bed, and there is no room for a rollaway. A king room sleeps only three. The hotel is recently renovated. In-room refrigerators are complimentary and available on a first-come/first-serve basis. Ask for a refrigerator when you schedule your reservation. When planning your next vacation, consider more than the price or brand. Considering hotel features and amenities, price and location, you’ll find the best hotel for your stay. Now it’s your turn. What’s the best hotel experience you’ve ever had. Did hotel amenities, price and/or location affect your experience? Or was it the intangibles? Comment below or share a favorite hotel tip on our Facebook Page. Our family received a discounted rate to stay at this hotel. The opinions shared are my own. (My kids weighed in on the sports court!) If we had been unhappy with the accommodations, we would have paid full price rather than write this review. We like using hotels where we’ve accumulated points towards free stays. Helps tremendously in planning future vacations. I love Marriott hotels! I wish it was affordable here just like the US. We always choose between Marriott hotels or Holiday Inn when we do road trips from New Jersey. The Marriott here in Manila is soooo expensive! No rooms less than P10,000 or $200+. And that’s without breakfast! Hope I get to try it though. Thanks for the review! 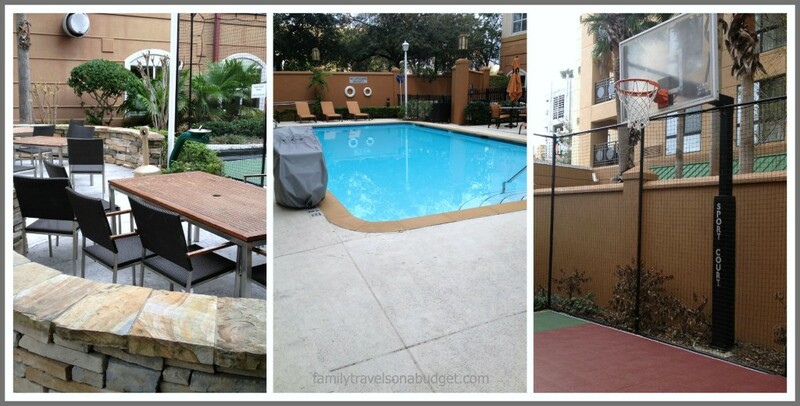 I love your tips about considering amenities, pricing and location. I’ll definitely keep these in mind when we plan our next trip. And, consider the Courtyard Marriott if I ever find myself in Tampa! This works more for budget hotels on the road, like Super 8, Microtel, Days Inns and such but it’s a good indicator for pretty much all hotels….Find out the year it was built. If it was built in the last 5 years or so it’s usualy much cleaner and items in the room are “newer”. Old hotels, especially the cheap ones, are rarely renovated but will cost the same as the newer hotel in the same class. I think calling the hotel and making sure they aren’t renovating (or hosting a big conference) is a great tip, because then the “relaxing” part will definitely not be present. We have had some awful hotels and some great hotels – we got some great deals with the Residence Inns – they were spacious, comfy, clean and accepted pets! We were all happy. We haven’t ventured into pet friendly travel yet, at least not beyond Grandma’s house!